In the midst of ongoing Russian aggression and a mysteriously missing plane, no one much is paying attention to the prairie chicken listing deadline: March 31. But then, that is why I am here. As you know I like to draw people’s attention to important energy issues—especially those that are not being covered by those with a bigger microphone and that is what I’ve done this week. One week ago, the Oklahoma Attorney General Scott Pruitt filed a lawsuit against the federal government over the environmentalist’s sue and settle tactics—which gave me the perfect opportunity to draw attention to the upcoming deadline for the FWS decision to list or not list the lesser prairie chicken under the ESA. Learning from extremists’ tactics, job creators file a lawsuit against the federal government (attached and pasted-in-below) is a bit long and detailed. But, I am pleased, it has done surprisingly well on Townhall.com. For those of you who post my work, I trust it will do the same for you. Remember, I also do a 900-word version and a 600-word version of each week’s column. If you’d prefer to be on that distribution list, please let me know. For the shorter versions, I will have to pull both the module on the political impacts and the module on the mindset and motivation of the environmental groups. Argh! It is such good stuff, I hate to cut it. Please help me spread the word on this important topic by posting Learning from extremists’ tactics, job creators file a lawsuit against the federal government, passing it on, and/or enjoying it personally!Thanks! For years environmentalists have usurped individual private property rights and thwarted economic development. Now, thanks to Oklahoma Attorney General Scott Pruitt, it appears that the job creators may have finally learned something from the extreme tactics of groups, like the Wild Earth Guardians and the Center for Biological Diversity (CBD), which have been using the courts to their advantage by filing lawsuits against the federal government. 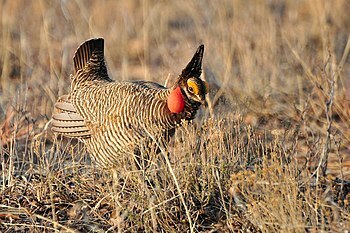 The Lesser Prairie Chicken (LPC) is especially important, as the FWS is required—based on the conditions set forth in the settlement of a 2010 lawsuit—to make a determination, explicitly, on the LPC by March 31, 2014. A “threatened” listing would restrict the land use in the bird’s 40-million-acre, five-state habitat: Oklahoma, Colorado, Texas, New Mexico, and Kansas. The affected area includes private, state, and federal lands—lands rich in energy resources, ranch and farm land—plus, municipal infrastructure, such as water pipelines and electric transmission. Understanding the negative impact a listing would have, industry (oil and gas, electric transmission and distribution, pipelines, agriculture and wind energy), states, and the FWS have collaborated to develop a historic range-wide plan (RWP) to demonstrate that the LPC and its prairie habitat can be protected without needing to list it. The RWP includes habitat management goals and conservation practices to be applied throughout the LPC’s range. According to a press release about the Oklahoma law suit, the cooperative effort has spent $26 million dollars on the voluntary conservation plan—which would be more than enough to protect restore LPC habitat, as well as to develop an elaborate state-of-the-art LPC hatchery. RWP enrollees are optimistic the FWS can cite the conservation commitment as justification for a decision not to list the LPC as a threatened species. A DEPA spokesman states: “this designation could disrupt drilling and exploration on hundreds of thousands of very promising oil and gas lands in this part of the country.” The CBD has made no secret of their disdain for oil and gas extraction and has filed many successful lawsuits specifically to block development. The “rush” as Moore calls it, is being driven by the desire to get the decisions made under the friendly Obama Administration—which may appease the environmental base while, unwittingly, hurting Democrats in the 2014 elections and handing the Senate to Republicans. The LPC decision impacts five western states, from which even Democrat Senators, aware of the potential economic impact, sent a letter to the FWS asking to delay listing the LPC as threatened. 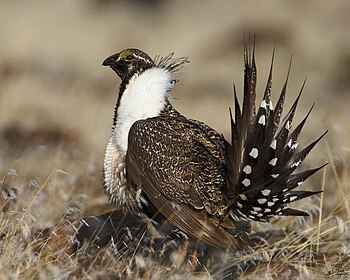 The next big listing is the Greater Sage Grouse (GSG) with a habitat covering eleven western states. If the LPC is listed, after the groundbreaking efforts to preserve its habitat, there will be no similar cooperation on the GSG. The GSG will surely be listed—triggering a modern Sage Brush Rebellion and costing Democrats the Senate (and some House seats, too). The Democrats are in a bind. The rushed listings are being forced by the environmental base, which is myopically focused on the anti-fossil-fuel (job-killing) agenda of restricting oil-and-gas development on western lands and isn’t looking at the bigger political consequences. It appears the decision has been made. Sources tell me that Dan Ashe, Director of the FWS, has called a meeting on Capitol Hill to brief the stakeholders prior to Thursday’s announcement. If he decides to list the LPC, Pruitt’s lawsuit could be just the first shot that ignites the new rebellion pushing states to take control of the lands within their borders. The environmentalists are looking at the end, but not the political means. For CBD, it isn’t even about the science. Its staff page boasts three times as many attorneys as biologists. In a High Country News interview with CBD co-founder Kieran Suckling, he explains how their strategy was developed through their first “major victory” over the Mexican wolf. When asked if his lack of a degree in science was a hindrance, he answered: “No” and pointed out that “the professionalization of the environmental movement has injured it greatly.” He added: “I’m more interested in hiring philosophers, linguists and poets. The core talent of a successful environmental activist is not science and law. It’s campaigning instinct.” They operate on emotion, not science. Cozy deals through which far-left radical environmental groups file lawsuits against federal agencies wherein court-ordered “consent decrees” are issued based upon a prearranged settlement agreement they collaboratively craft together in advance behind closed doors. Then, rather than allowing the entire process to play out, the agency being sued settles the lawsuit by agreeing to move forward with the requested action they and the litigants both want. Gratefully, Oklahoma Attorney General Scott Pruitt has stepped up to the plate and used the environmentalists’ tactics and filed a lawsuit against the federal government. It will not delay the March 31 deadline for the FWS decision on the LPC, but it could “overturn designations of dozens of species added to the threatened or endangered list through the ‘sue and settle’ process.” It could prevent the unnecessary listing of thousands of other flora and fauna—allowing companies to continue providing the jobs, producing the oil, natural gas, and other commodities such as timber and critical minerals that are so important to America and our energy freedom.